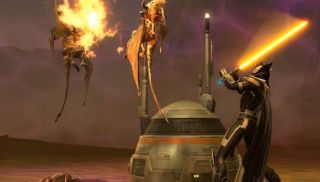 Bioware have released a trailer for the now-live 2.0 update to Star Wars: The Old Republic. The update is titled "Scum and Villainy", which does make you wonder if old Obi Wan would have been quite as hard on Mos Eisley Spaceport if he'd seen the general chat of a modern MMO. Although perhaps "you will never find a more wretched hive of pettiness and spammers" would be more apposite. The 2.0 patch, released ahead of the April 14th launch of the Rise of the Hutt Cartel expansion, adds in the titular Scum and Villainy operation, upgraded "Hard Mode" flashpoints and operations for Level 55 characters, new Legacy Achievements and class combat changes designed to make you more powerful at every level. To reach the new Level 55 cap, you'll need to purchase Rise of the Hutt Cartel, which is currently available as an early access for pre-orderers. The patch also reworks the PvP bolster system, which you can read about here .